Dr. Liat Furyan-Banach graduated from New York University College of Dentistry in 1998, that is currently considered one of the top 10 dental schools in the world. She then completed a year of General Practice Residency at the Staten Island University Hospital (considered one of the top 100 hospitals in the United States). Dr. Furyan-Banach is a continuing education junky. She loves to keep up with the fast changing world of dentistry, in our world of new technology and materials. She keeps up with the latest techniques and procedures to give her patients optimum treatment. 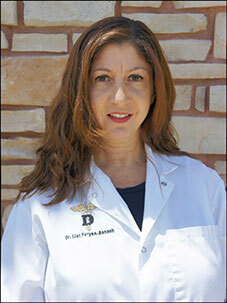 Dr. Furyan-Banach is gentle and calming and prides herself in excellent dental skills. She moved to Arizona in 2005 with her husband and two children, Julia and Jordan, and loves living here. After work, she mostly enjoys spending time with her hubby and kiddos. She can usually be found cheering at her kids baseball and softball games, or cooking a home made dinner for her family. Misty's friendly voice and big smile will greet you as you come in to our office. Misty started out as a dental assistant (18 years) and loved it. She became cross trained with front office duties and found a whole new passion for office management. As office manager, her extensive knowledge in assisting has given her the unique perspective to bridge the gap between back and front office, providing seamless flow for patients from the time they come in, getting treatment and through checking out. She will solve just about any questions or concerns you may have. She truly cares about each and every patient. Misty is a newlywed with two beautiful and bright step daughters. On her off time, she enjoys time with family, cooking and crafting. 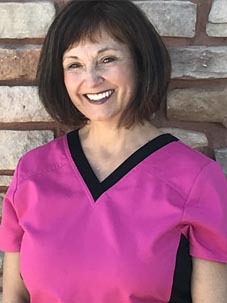 Our dental Hygienist, Judy, comes to us from Spokane, WA. 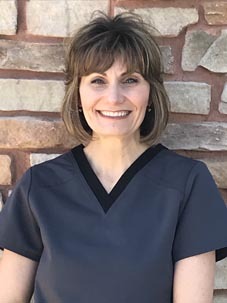 With a Bachelor of Science degree in Dental Hygiene from Eastern WA University, she is highly committed to her profession and dedicated to offering you the most comprehensive treatment to ensure periodontal health. When Judy is not at the office, she can be found exploring life with her four adorable grandchildren. Additionally, she is an avid cyclist, hikes, rock climbs, and loves the diversity of the AZ landscape. Lesley is our highly qualified and energetic leas assistant. She was born and raised in Canada, where she began her dental assisting career in 1990. Lesley's extensive experience and friendly rapport is noted and appreciated by all of our patients. 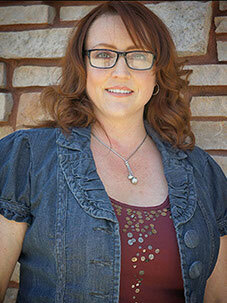 Lesley relocated to the Valley 7 years ago and resides in Maricopa with her husband and daughter. On her off time, Lesley enjoys hiking, biking, and traveling, as well as taking in a movie or sporting event.